Imagine being able to order takeaway from a local chef who has worked at The Ivy or Jamie Oliver’s Fifteen; from a MasterChef finalist, or even from an up-and-coming cook based in your neighbourhood. Then envisage having this meal delivered straight to your door, and all for the same price as a pizza or curry from a well-known chain. Well, Housebites promises just that. Launched in London in September 2011 and coming to Bristol on 24th August 2012, Housebites is a marketplace where customers can order meals from local chefs preparing freshly cooked takeaway food in their own homes (fully regulated), using the highest quality ingredients. 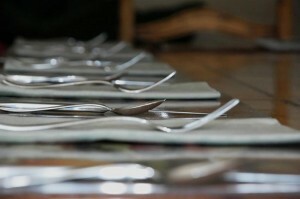 The menu choice is constantly changing, based on which chefs are on duty and which meals they plan to cook that evening. The chefs’ individual menus are devised each week according to what’s in season and what their customers are requesting, and everything is cooked to order, using the freshest produce. Having launched in London just nine months ago, Housebites has received an ongoing flow of media attention, and has also been popular in the celebrity world, with figures such as Stephen Fry and Lily Allen tweeting about successful meals they have ordered through the service. Housebites is the brainchild of serial entrepreneur Simon Prockter. Prockter is no new kid on the block, having brought speed dating to London and Bristol in 2002 with SpeedDater. MasterChef finalist Andy Oliver is also part of the Housebites team, and is helping to handpick the best local culinary talent. Prockter explained that launching Housebites in Bristol was a natural and logical move for the company, and followed numerous customer requests. “Bristol contains an amazingly passionate and forward-thinking population of foodies” he stated, “people who love fresh, local food, people who enjoy discovering new cuisines, and people who just don’t have the time to cook for themselves. Housebites is coming to Bristol to cater for all of these people, and to provide locals with the opportunity to order quality takeaway food at great prices, with just the click of a button”. Housebites will be launching in Bristol on 24th August. The Housebites team are currently interviewing and taste-testing the food of an array of chefs from Bristol, aiming to recruit a varied group of experienced, talented chefs, who will then go on to cook fresh takeaway food for the people of Bristol. “Our aim is essentially to make good, freshly-cooked takeaway food accessible to the masses”, explained Prockter, “and launching in Bristol is a huge step in the direction of making that aim come true”. Housebites is helping to create jobs for chefs, allowing them to earn good money working from home – often more than they’d earn in a restaurant. Chefs wishing to join the service are welcome to apply. For more information, visit the Housebites website by clicking here.